Bolstered by the U.S. shale revolution, global oil production has surged by over 20 percent in the past 15 years. The great rise has put to bed the “peak oil production” theory but it has not stopped the apparent new concern of “peak oil demand,” now portrayed as perhaps the main threat to the future of the world’s oil industry. In fact, it’s hardly just anti-oil environmental groups; many of the major producers themselves (Royal Dutch Shell plc in particular) assert that global oil consumption will soon peak and thereafter begin its terminal decline. The basis of this belief is the growth of electric vehicle sales and the need to reduce oil use to combat climate change. 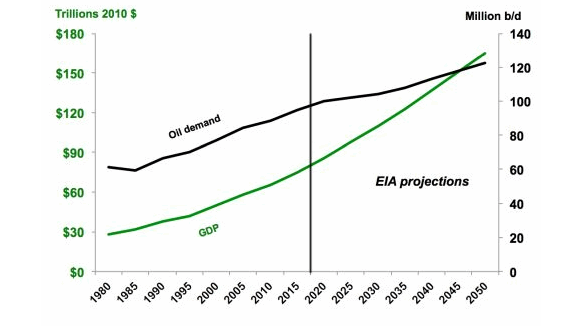 Yet for oil, what’s past is prologue: even with higher prices, both the Energy Information Administration (EIA) and International Energy Agency (IEA) modeling have repeatedly forecast more demand for as far as the eye can see. After all, oil is the world’s most important fuel, supplying 35 percent of all energy used. While the link between economic growth and oil use can be viewed from a variety of perspectives, the two clearly progress in tandem – a long studied link demonstrated in regression modeling and peer-reviewed studies. Indeed, as the main energy source that powers the world’s economic engine, oil is so important that demand is ever-growing: 61 million barrels per day (MMbpd) in 1980, 77 MMbpd in 2000, and 100 MMbpd this year. Over the past 33 years, annual global oil demand has only failed to increase three times, tellingly all during times of economic recession. Looking forward, with no significant substitute whatsoever, there is simply no evidence that global oil demand will peak anytime soon. Around 85 percent of the global population lives in still developing nations, such as China, India, Pakistan, and Nigeria. They have huge populations, and their future transport needs contingent on more oil are just now coming to light. These poorer countries naturally seek to become rich, and the West has shown them that the ascension from poverty begins as extensive petroleum-based transportation infrastructure gets constructed. These systems are capable of achieving massive economies of scale that provide large amounts of energy at low cost. Illustrating the high value of oil, the rich OECD nations constitute 46 percent of global use despite being just 15 percent of the population. The numbers in oil’s favor are overwhelming. The global oil-based passenger vehicle fleet is around 1.5 billion, with 95 million new ones being bought this year alone. In total, there are less than 5 million electric cars in operation, a growing niche market but nowhere near lowering oil demand in any significant way. In fact, just achieving a 20 percent market share of total global car sales by 2040 would be a huge achievement for those running on electricity—but not nearly enough to significantly reduce oil needs since more oil-requiring planes and heavy-trucks will compensate. Ultimately, the fact remains: until we see an absolute decline in global oil demand over a number of years (not just a decline in incremental growth) the idea of “peak oil demand” is without substance. So, while it is understandable that oil titans like Shell want to position themselves as “natural gas majors” in the era of climate change and anti-carbon policies, they would be well advised to remember that oil’s future is pretty bright too.